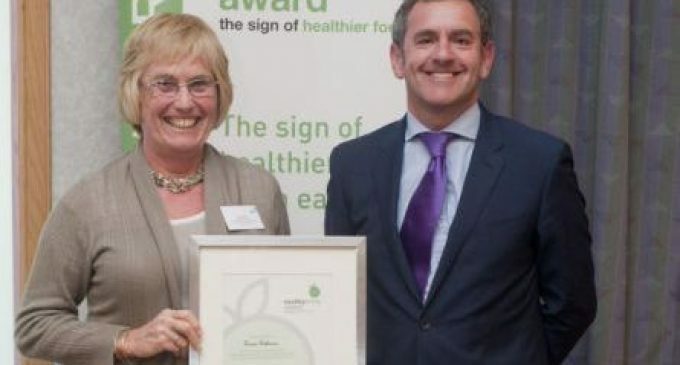 A hospital tearoom has been re-awarded the healthyliving award (HLA) for a second term, having stepped up its efforts to offer customers healthier choices. The Inverclyde Royal League of Hospital Friends Tea Bar – a volunteer-run café housed within the Greenock medical institution – has reworked its menu to offer healthier snacks and treats. Helen Wylie, Tea Bar Convener, has volunteered there for over 30 years and now works with a group of 90 like-minded staff who are committed to providing healthier choices within the café. Like all HLA-accredited businesses, the tea bar needed to ensure that at least 50% of the menu choices adhered to the award criteria. Having traditionally sold a large number of cakes, including cream cakes, the tea bar has now implemented various changes to the food offering in order to make the menu healthier. While treats are still on offer, the range has been vastly reduced, and the outlet now offers brown and wheatgerm filled rolls accompanied with salad, in addition to fresh fruit, low fat yogurts and other items which comply with the healthyliving criteria. To find out more about the CIS Excellence Healthier Scotland Award, sponsored by the healthyliving award in association with NHS Health Scotland, visit http://www.cis-excellenceawards.com. The closing date for entries is Monday 10th March 2014, and the ceremony is being held on Thursday 29th May at the Hilton Glasgow.